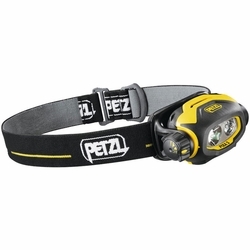 Petzl PIXA 3 Headlamp. The PIXA 3 headlamp is rugged and versatile. The multi-beam adapts to all situations: close-range work, movement, and long-range vision. CONSTANT LIGHTING technology: brightness does not decrease gradually as the batteries are drained. Depending on the need, it may be worn on the head, mounted on the helmet, or placed on the ground.